The inaugural lecture of the Greenberg Distinguished Scholar Program will take place Tuesday, April 24, at 5:15 p.m. in Vollum lecture hall. Established on the occasion of Reed’s centennial with a gift from Dan Greenberg ’62 and his wife and philanthropic partner Susan Steinhauser, the program aims to bring visiting scholars to campus to stimulate and support the work of students and provide faculty with the opportunity for in-depth intellectual exchange with a prominent member in their field. 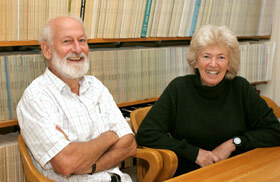 Peter and Rosemary Grant, the program’s first recipients, have been studying Darwin’s finches on the Galápagos islands since 1973. Their fieldwork, designed to understand the causes of an adaptive radiation, combines analyses of archipelago-wide patterns of evolution with detailed investigations of population-level processes on two islands, Genovesa and Daphne. Rosemary was initially trained at the University of Edinburgh, received a PhD degree from Uppsala University, and was a research scholar and lecturer with the rank of professor in the department of ecology and evolutionary biology at Princeton University until she retired in 2008. Peter is the Class of 1877 Professor Emeritus in the same Department, having trained at Cambridge University and the University of British Columbia. Before joining Princeton in 1986 he taught at McGill University and the University of Michigan. The Grants’ lecture will draw from the work of Charles Darwin as well as from more recent insights in the fields of genetics, behavior, and ecology that have continued to illuminate how and why species evolve. Darwin envisioned a three-step process for species formation: colonization, involving the expansion of a population into a new environment; divergence, when populations become adapted to novel environmental conditions through natural selection; and finally the formation of a barrier to interbreeding between divergent lineages. He also suggested that investigations of what we now call “very young adaptive radiations” might provide windows through which we can view the processes involved. In this talk, the Grants will discuss the progress that has been made in understanding speciation, with special reference to the young radiation of Darwin’s finches. Dan Greenberg joined the Reed board of trustees in 1975, serving as chair for eight years. He and Susan, already significant supporters of the college, helped Reed’s Centennial Campaign gain early momentum in 2007 through a $10 million commitment.